Pokémon trainers in the Alola region will be happy with the newest update to the Pokémon Bank storage system. Trainers will be able to transfer early generation Pokémon to their Sun and Moon games. You’ll be able to transfer your Pokémon from the virtual console Red/Blue/Yellow versions to Sun and Moon as well. You’ll also be able to transfer Pokémon from the likes of X,Y, Omega Ruby, and Alpha Sapphire to the Alola region. There is more to the Pokémon Bank update than just being able to transfer Pokémon. The Pokedex feature and Adventure Records will become viable features for Pokémon trainers. The Pokedex will update to allow trainers to see all the Pokedex entries for all games connected to Pokémon Bank. Adventure Records will allow trainers to “relive” their adventure and see how many Pokémon they caught. Info such as wild Pokémon encounters will be interesting to see! Trainers who use Pokémon Bank from January 25th to October 2nd will be able to get their hands on a limited Z-move item. 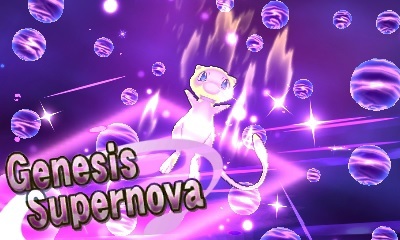 Mewnium Z. Mewnium Z will allow Mew to use the Z-move Genesis Supernova, if Mew knows Psychic. The Mewnium Z crystal is not obtainable through regular means so as of right now is the only way to teach Mew this Z move. Trainers will be able to earn Poke miles in Sun and Moon when they deposit Pokémon into Pokémon Bank. What you spend the miles/battle points on will show who the good trainers are.